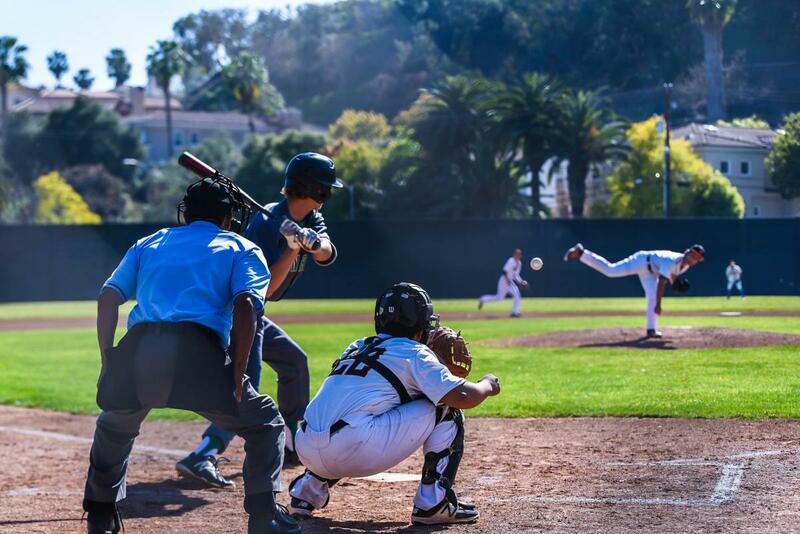 San Gabriel Valley Unit – Welcome to the official website of the San Gabriel Valley Unit of the California Baseball Umpires Association (CBUA), serving nearly 30 high schools in the San Gabriel Valley of Los Angeles County, California. Another area in which we need more consistency is the hybrid position. “Hybrid” is not a word that you will find in the rule book, but the definition of a hybrid something that is made by combining two things together. A “hybrid” position is a combination of the windup and the set positions. 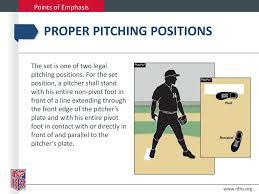 Rule 6-1-1 states, “The pitcher shall pitch while facing the batter from either a windup position or a set position. the position of his feet determine whether he will pitch from the windup or the set position.” Further, it states that the pivot foot must be in contact with the pitcher’s plate. 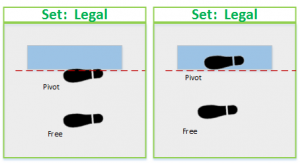 Interestingly, “non-pivot foot” is not defined in the rule book. However, Rule 2-28-6 defines the pivot foot as the “foot with which the pitcher contacts the pitcher’s plate when he delivers the ball”. 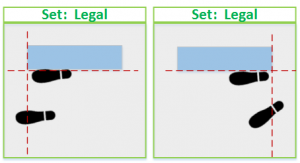 Logically, the non-pivot foot is the foot that does not contact the rubber when the ball is delivered. For a right-handed pitcher, the right foot is the pivot foot, and the left foot is the non-pivot foot. 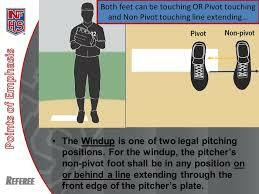 Conversely, for a left-handed pitcher, the left foot is the pivot foot, and the right foot is the non-pivot foot. 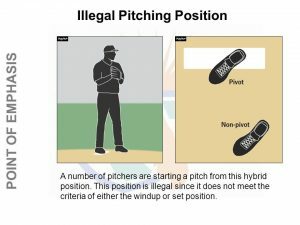 Rule 6-1-2 defines the wind-up position stating, “The pitcher’s *non-pivot foot* shall be in any position *on or behind* a line extending through the front edge of the pitcher’s plate.” In other words, the heel of the non-pivot foot can be as far forward as touching the front edge of the rubber. It can also be so far back that the toes are entirely behind the rubber. Remember that this year’s editorial change made it so that the entire pivot foot no longer needs to be in contact with the rubber. As long as part of the pivot foot is touching the plate, the pitcher has met the conditions for the pivot foot. 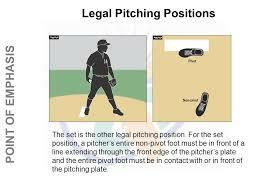 Rule 6-1-3 defines the set position, stating that “he shall stand with his *entire non-pivot foot in front of a line *extending through the front edge of the pitcher’s plate and with his *pivot foot in contact with or directly in front of and parallel* to the pitcher’s plate. 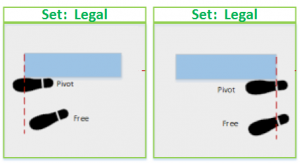 Note that it does not say which direction the non-pivot foot has to face. It can be perpendicular to, at an angle to, or parallel to the rubber. It also does not give lateral restrictions to the non-pivot foot–it does not have to be within the side edges of the rubber. Remember, we do not want to be overly technical, nor do we want to give any team an advantage or disadvantage. Use preventive umpiring as much as possible. Try and fix it as the pitcher is warming up, or have the catcher or 1st baseman call time and talk to the pitcher before anyone starts to complain. We are always striving to be consistent–not only in our own personal games but as a unit as a whole. One area where it seems that there is a lot of inconsistency is the Hit by Pitch rule. 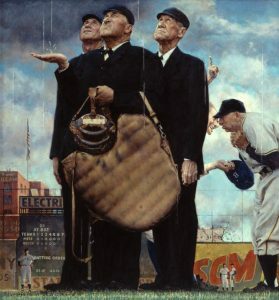 It seems like a pendulum, where some umpires are placing an unnecessary burden on the batter to get out of the way and others put them on anytime they get hit. As with most things, the middle ground is the best way to go. There is no rule that states that the batter has to make an attempt to get out of the way of a pitch. Rule 7-3-4 states, “A Batter Shall Not permit a pitched ball to touch him.” When a fastball is inside and a batter freezes, that is not permitting a pitched ball to touch him; he should be awarded first base. When a batter misreads a curveball that doesn’t break and gets hit, he is not permitting a pitched ball to touch him; he should be awarded first base. When a pitch is so far inside that the batter turns his back to the ball and gets hit squarely in the back, that is not allowing a pitched ball to touch him; he should be awarded first base. In football, we look for certain “indicators” to call certain fouls. We can apply that to HBP as well. 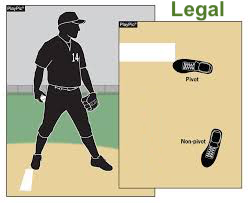 If a batter has opportunity to get out of the way but sticks out his arm or leg, that is an indicator that he permitted the ball to hit him; he should not be awarded first base (unless it was also ball four). If a slow pitch is inside and the batter makes no move, that is an indicator; he should probably be kept at home. Now, just because an indicator is present, it doesn’t mean that we are going to keep the batter home. That’s where we have to use our judgment. Did the batter have a reasonable chance to get out of the way and did he make a reasonable effort? That’s your judgment. This is a safety rule. When I keep a player at the plate because he permitted the pitch to touch him and a coach complains that it is a safety rule, I respond by saying, “That’s right, coach. It’s not safe for your batter to let the pitch hit him.” That being said, when in doubt, error on the side of safety and send the batter to first. Congratulations to Tim Triplett for being elected to the position of Secretary-Treasurer for the 2020 season, and to Will Fortner, Richard Ilizaliturri, and Louis Ortiz for being elected as Board Members at Large for the 2020-2021 seasons. The 2019 classification exam is now available. There is no pdf available to download, and you have to take the test in one sitting. We will be using Exam B in the San Gabriel Valley Unit, and you can access the test on the CBUAUmp website by clicking here. The exam closes at 11:59 P.M. on 2/10/19. Due to the predicted rain, the field clinic for Saturday, February 2 has been moved inside to ELAC. Although we will be inside, it will still be a field clinic with a pitching station, a 1st base station, and an infield station. Please wear your base gear and bring your mask and indicator. If you can, please bring a glove and a tennis balls and/or baseball. If anyone can bring a home plate and bases, it would be greatly appreciated. The clinic starts at 10:00 a.m. and will be held in the same room as our classes have been in building C1. Remember that you are required to attend a field clinic to be certified. If you have already attended an SGV field clinic, you are welcome to attend this one as well, but you are not required to.